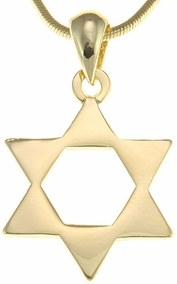 Golden Jewish Star . Pendant is 3/4" X 3/4". 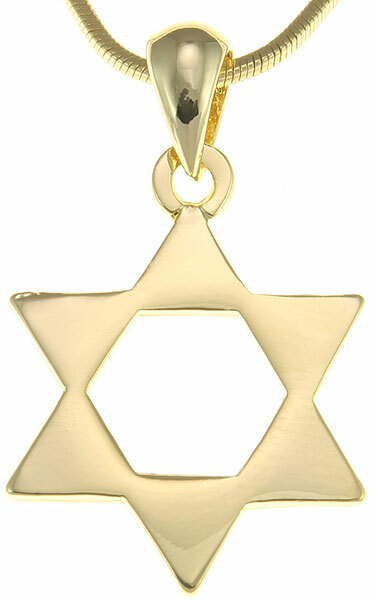 The Star of David or Shield of David is a generally recognized symbol of Jewish identity and Judaism. It is named after King David of ancient Israel. With the establishment of the state of Israel in 1948 the Star of David on the Flag of Israel has also become a symbol of Israel and has become associated with the Zionist movement. A popular folk tale is that the Star of David is literally modeled after the shield of the young Israelite warrior David, who would later become King David. In order to save metal, the shield was not made of metal but of leather spanned across the simplest metal frame that would hold the round shield: two interlocking triangles. Naomi Jewelry is proud to have in stock such a meaningful piece of spiritual Jewelry.